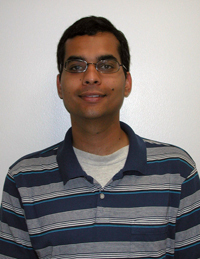 Current ISR postdoctoral researcher Vijay Gupta has accepted a faculty position at the University of Notre Dame in South Bend, Ind. The assistant professor position, in the Electrical Engineering Department, begins in January 2008. As an ISR postdoc, Vijay has been conducting research with Professor John Baras (ECE/ISR) and Assistant Professor Nuno Martins (ECE/ISR) on collaborative control of multi-agent systems and the interplay between communications and control in such systems. He will continue his close collaboration with Professors Baras and Martins and their research students through the rest of 2007. Vijay Gupta's research interests lie in the broad area of networked systems, distributed estimation, control over communication channels and systematic component-based design of multi-agent systems. Dr. Gupta completed his PhD in June 2006, at the California Institute of Technology, where his advisors were Professors Richard Murray and Babak Hassibi. He joined ISR in September of 2006. Professor Baras commended, "A very well deserved appointment. Vijay is working in the very challenging area of networked systems, distributed estimation, control over communication channels and systematic design of multi-agent systems. The most challenging aspect of this whole area is the lack of analytic methods to synthesize such systems. This is where Vijay has made already important contributions by studying aspects of the information pattern of the agents, i.e. questions like what information to transmit, when to transmit it, with whom to exchange information. We have already several joint publications since he joined ISR, and we look forward to continue our collaboration with him, when he joins Notre Dame. Congratulations Vijay!"